ST HELENA. 1884-94. 1/2d to 4d. MOUNTED MINT. ST HELENA. SG 97-110, 1/2d to 5/-. MOUNTED MINT. ST HELENA. 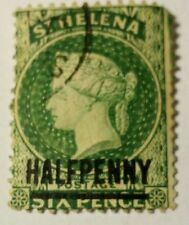 SG 45, 1/- YELLOW-GREEN. CROWN CA WMK. MOUNTED MINT. ST HELENA. SG 1, 6d BLUE. LARGE STAR WMK. ST HELENA. 1884-94. USED SELECTION. ST HELENA. USED SELECTION. QV to KGVI. ST HELENA. SG 21 & 30, 1d LAKE & 1/- YELLOW GREEN. MOUNTED MINT. All Stamps are Mint, looks like some where previously hinged, there is a very faint shadow of a hinge . 1922-37 George V £1 Grey and purple. Lightly mounted mint. The 8d definitive is neither the 'Sage-green' or the 'olive-green' printings as listed. The colour is close to no 29 Grey Green on the Stanley Gibbons Colour chart. MNH = Mint Never Hinged; MH = Mint Hinged ; MNG = Mint NO GUM; FU = Fine Used. Lightly hinged mint with small. 1922-37 7/6d Grey-brown and Yellow-orange. 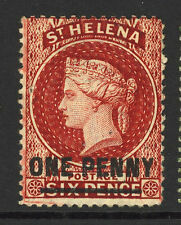 St Helena 1922-37 7/6 brownish grey and orange SG111d MLH cat £1300 - very slightly toned appearance and gum. MLH/MM (etc) - a mix of MLH and MM with the majority being MLH. MLH - Mint Light Hinged - lightly hinged no hinge remainders. A nice stamp. It looks as though its been cropped at the bottom. The perf is there, the holes just havent been punched cleanly. St. Helena QEII 1953 complete definitive set mint o.g. St Helena - Small mint collection in springback album. See pics below. St Helena - Small mint collection in springback album. See pics below. Any problems WILL be an honest mistake and I will be happy to resolve it! 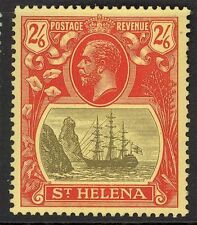 STAMPS-ST HELENA. 1922. 2d Grey & Slate. Variety Cleft Rock. SG: 100c. MH. 2d Grey & Slate. Variety Cleft Rock. Fresh Mint Hinged. The flat rate cost of this service is £9.99. ST. HELENA SG113, 15s grey & purple/blue, VFU. Cat £2750. BPA CERT. (25p) - Deepwater Gurnard. (80p) - Gurnard. (£2) - Hogfish. St Helena 2008 Fish Definitives - Mint Never Hinged (MNH). (35p) - Red Mullet. Set of 12 values (12v Set) (10p) - Five Finger. (50p) - Rock Bullseye. ST. HELENA. QV selection from 1864 and 1868, used. 4 USED VALUES. ANY PROBLEMS WILL BE AN HONEST MISTAKE AND I AM HAPPY TO RESOLVE IT! 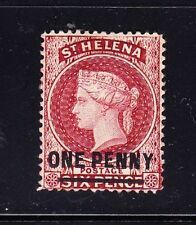 St Helena 1856 SG 1 CANC F/VF. Sieger: Zeppelin. Zumstein: Switserland. Stanly Gibbons: Great-Brittan and colonies. Dutch dealers catalogue: Netherlands and colonies. Used Catalogues. Unused no gum. Mostly Mint. Beautiful quality collection, virtually all Very. Fine, Mint Original Gum Hinged. a pretty image. 150 FREE professional. SCROLL DOWN FOR MORE IMAGES. < < < < < < < < < < < < < < < <. Edward Younger Co.